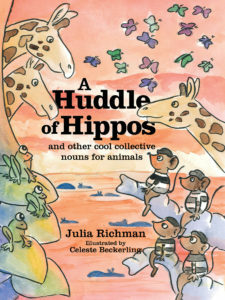 A Huddle Of Hippos is full-colour picture book that introduces a variety of collective nouns for animals to a young audience. Following the character of Sam on an African safari trip, the reader is introduced to two to three collective nouns per page with a funny, rhythmic, rhyming text and pictures playing an important role in telling the story. Aimed at ages 4 to 8 Years, the book is an exciting and accessible learning tool for children who are working with collective nouns at school; it also serves as a fun and enchanting read for a younger audience.